The leading housing developer in eco-friendly living, responsible for bringing the first net zero energy multi-family housing to the U.S., MODUS Development, is now set to unveil their next three projects for 2017: a residential townhome community in Scottsdale, Arizona, an urban residential community in Tempe, Arizona and the second phase of their first nationally acclaimed Net Zero Energy (NZE) project, MZ Townhomes in Scottsdale. After becoming the first to develop an NZE townhome community in Arizona, and among the first in the nation, MODUS Development then also partnered with Viridis Group to debut a zero-energy multi-family housing complex, called Equinox Apartments, in 2016. The complex featured a staggering 1,100 solar panels, was accomplished within the same budget as a non-NZE build out and was fully leased in less than five months, far exceeding expectations. In the first quarter of 2017, MODUS Development will break ground on Eclipse, a 20-unit luxury townhome residential community on 1.4 acres located on the southeast corner of McDowell and Granite Reef Road in Scottsdale, Arizona. As one of the only sites available for development in the McDowell Corridor, it will become the third NZE community in the state following MODUS’s MZ Townhomes and Equinox. With an expected completion date within the third quarter, Eclipse will feature three three-story buildings with a total of 20 townhomes ranging in size from 1,811 to 2,065 square feet, each with a two-car garage, two bedrooms, two baths and a third guest bedroom option. Architecturally unique, in the shape of an eclipse, the property will also feature a circular pool surrounded by lush landscaping. Home prices will start at $399,000 and adjusted for view premiums, upgrades and size. Also in the first quarter, Gorman and his team will begin construction of one of the most groundbreaking and innovative new residential projects in Tempe, called The Roosevelt. This urban community – located only two blocks from downtown Tempe and immediately west of the bustling Mill Avenue district – will feature 32 three-story residences each including over 1,800 square feet of living space with two bedrooms, two baths, large recessed windows and decks and a two-car garage. 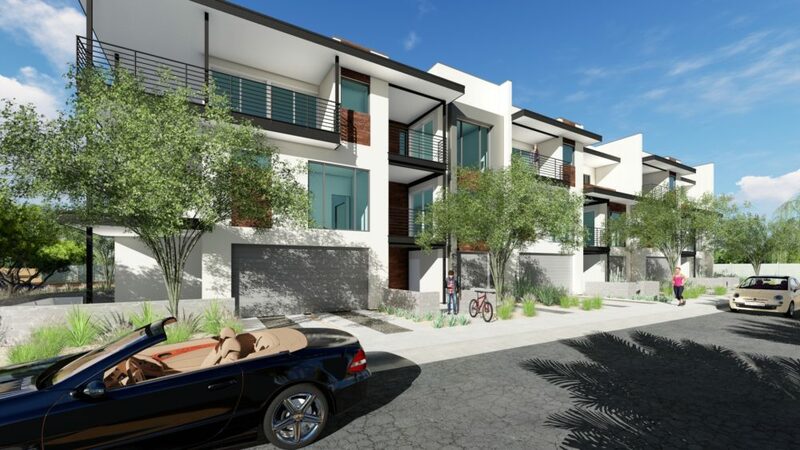 The third project on the horizon for MODUS Development, also in Arizona, will be the second phase of their nationally acclaimed MZ Townhomes in Scottsdale (located just one block east of the Scottsdale Road and Camelback Road intersection). The new community will feature 11 townhomes within two three-story buildings ranging in size from 1,313 to 2,171 square feet with both one and to-bedroom units with one and two-car garages respectively. Differing from the first development, the new townhomes will also feature large balconies, a private ground floor patio and a community heated pool and spa with barbecue. Construction is expected to begin mid-year with a planned completion date within the first quarter of 2018. This article first appeared in Az Big Media, click for more.